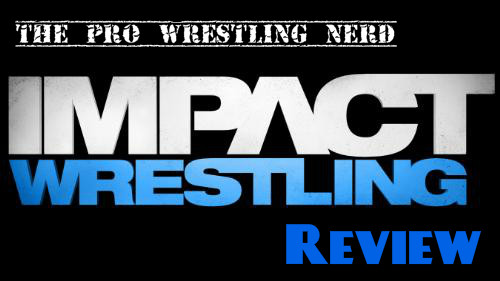 On this edition of IMPACT Wrestling, The Aces and 8’s revealed a new member, Jeff Hardy upped the ante for his World Title defense against Austin Aries at Turning Point, Christian York went through the Gut Check, and ODB welcomed Jessie Godderz to the TNA ring in a vicious way. Click “read more” for a full review of the show. This week on IMPACT Wrestling: A new TV Champion is crowned, the latest Gut Check contestant faces the judges, more matches are announced for Bound For Glory, and Hulk Hogan and Sting head to the Aces and 8’s clubhouse…through awkward circumstances. Here’s what to expect on tonight’s edition of IMPACT Wrestling, according to the official preview on TNA’s website. With Devon gone from TNA, the TV Title has officially been vacated and a new champion will be decided tonight on “Championship Thursday”. GM Hulk Hogan will hear the cases of four wrestlers (Samoa Joe, Magnus, Mr. Anderson, and Garett Bischoff) and decide which two will meet in the squared circle to decide the new champion. Speaking of Hogan, he promised the Aces and 8’s last week that he would meet them on their turf, a place known as “The Clubhouse”. Given their kidnapping and brutal assault of Joseph Park last week, will Hogan still go through with it? Also expect some sort of update on Park’s condition following said attack. TNA Gut Check prospect Evan Markopolous came up short last week in his match against Douglas Williams and tonight the TNA Gut Check judges (Bruce Prichard, Taz, and Al Snow) will meet and decide if he’s deserving of a TNA contract. With 3 weeks to go until they meet in the main event at Bound For Glory (peep the up to date lineup of the show thus far after the preview), TNA World Champion Austin Aries and Jeff Hardy will be both be on the show to continue building to the match and adding new wrinkles to their newfound rivalry. Will Aries once again attempt to try to prove that he can do anything Hardy can do? Bully Ray shocked TNA fans by defeating Aries in the main event of last week’s show. What does this mean for the superstar going into TNA’s biggest event of the year? All of this and much more will happen tonight on IMPACT Wrestling at 8PM/7PM Central on SpikeTV. Last night, IMPACT Wrestling not only continued the build to Bound For Glory (adding a title match to the upcoming PPV), but it also had the benefit/detraction of Open Fight Night and the latest TNA Gut Check. How did this show fare after a really good show last week? Click “read more” to find out! With No Surrender now in the books, the road to Bound For Glory began last night. Did IMPACT Wrestling start with a bang or a thud? Click “read more” to find out!